The slender, traditional style legs and narrow rectangle top presented by our Amish English Console Table is simply stunning. Arrange this piece in your hallway or prop it against the back of your sofa for some additional surface space. This reclaimed, solid wood accent table displays both beauty and functionality. Decorate the top with some family photos and potted plants for a warm, hospitable look in your home. Introduce your home to a fresh new look that demonstrates the beauty of nature and organic wood furniture. If you're on the hunt for a reclaimed table that's a bit more ornate, consider our Amish Cabriole Console Table with a simple shelf to conveniently hold your decor! 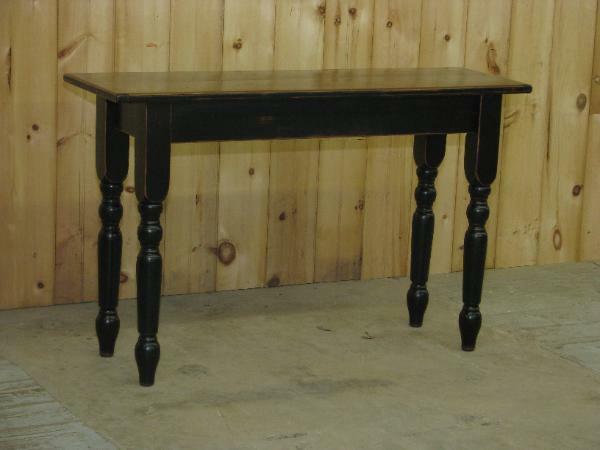 Or, take a simpler route with our Amish Shaker Console Table with shelf. Call our Amish furniture specialists today at 1-866-272-6773 with questions about our reclaimed furniture collection or stop by our store to see some of our handcrafted, solid wood furniture for yourself.